Most people might stop at fantasizing about life-size building blocks, but not Rosan. He created them. Rosan is the founder of EverBlock, a modular system of full-scale plastic blocks that, like Lego, stack atop each another and lock together with raised lugs. But EverBlock is more tool than toy. You can use the polypropylene blocks to build fully-functioning furniture and structures. They come in 14 colors and three sizes: full (one foot long), half (six inches), and quarter (three inches), and vary in weight from two pounds (full size) to a quarter pound. EverBlocks assemble more or less like any other modular building blocks, but on a larger scale. But as the blocks get bigger, building with them gets more complicated. “When we first started, I envisioned that people would know instinctively how to build with them,” Rosan says. That wasn’t the case. In miniature scale, it’s easy to gain perspective on how blocks fit together. At life-size scale, it gets more challenging. “People start to worry about stability,” he says. It’s no big deal if your 3-inch wall topples, but it is a problem if your 15-foot wall does. The key is to take lessons from Lego, and stack the blocks like bricks, staggering them so a brick covers the seam of the two below it. Each block also has at least one channel that allows power cables, reinforcing wooden dowels, or LED strips to snake through as a means of illuminating or stabilizing larger structures. Rosan created EverBlock as a way of easily constructing furniture like couches and coffee tables, but he quickly realized the big blocks have applications far beyond that. People have built house-like structures, room dividers, and art. The product’s website features a virtual builder tool people can use to create designs and determine how many bricks they’ll need. The company is compiling a library of instructions guiding people through some designs. When Rosan outlines his desire to expand EverBlock to include windows and doors, it’s easy to see it becoming a new substrate for construction. That’s not a bad idea. 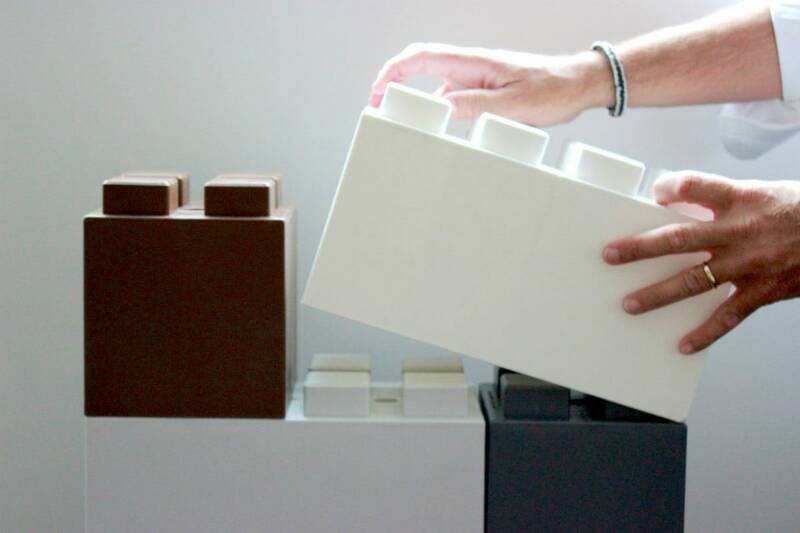 Like all modular systems, EverBlock’s real benefit is in its efficiency. But with just three block versions, there are limitations to what you can build with the blocks. Don’t expect a life-size version of Lego’s architecture series just yet (though how cool would that be). Still, when you need to construct something quickly, something like this could be a smart solution. Think about emergency shelters: “You could drop two pallets of these by helicopter and the next thing you know you have a solid, rigid structure,” says Rosan. It’s an intriguing thought and a new play on prefab, modular housing. Will we one day be the IRL version of Emmet Brickowski, wandering cities built from plastic bricks?